SAN ANTONIO, TX--(Marketwire - Feb 7, 2012) - Pizza Patrón, the nation's #1 Latino pizza brand, celebrated the opening of its seventh store in San Antonio on Monday. 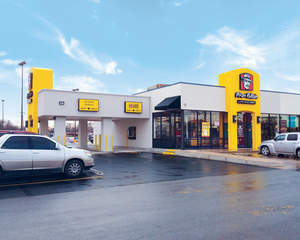 The store, located at 6700 S. Flores St., is the company's newly developed 'double drive-thru' model, the first of its kind in the chain. "We created the double drive-thru concept to increase the speed and convenience for our Lista customers," said Andrew Gamm, brand director for Pizza Patrón. "They no longer have to wait behind cars with custom orders." "The speed of the double drive-thru and our low prices make our pizza a particularly competitive lunch option for customers who have limited time and budget," Gamm said. "Pizza Patrón's slogan 'Más Pizza. Menos Dinero.®' has always defined the brand. Now, 'Más Pizza. Menos Dinero.®' is quicker and more convenient than ever." Since 1986, Pizza Patrón has been committed to making its promise of "Más Pizza. Menos Dinero.®" a reality for every customer. From the beginning, the brand has been recognized for its 'fresh-dough' pizza, its low prices and its trademark "friendly, bicultural service." In 2007, the company drew international media attention when it decided to accept Mexican Pesos at all of its restaurants, gaining over 500 million media impressions in the U.S. alone. Today, Pizza Patrón is the nation's premier Latino pizza brand and remains dedicated to bringing its unique experience to life with every pizza made, and in every community it serves.